Imagine you live in a world attacked by massive kindness. Good spirit and warm-hearted people are spread everywhere. Wherever you go you see beautiful smile on the faces, and sparkling eyes that invite you to share the joy. Unfortunately, that may not happen in real life, but does happen in Lorene Scafaria’s “The Meddler” which makes you wish it to happen to everyone around you. It’s a film that triggers a very special emotion and allows you to connect with the film the way that you feel as if it were a part of you. 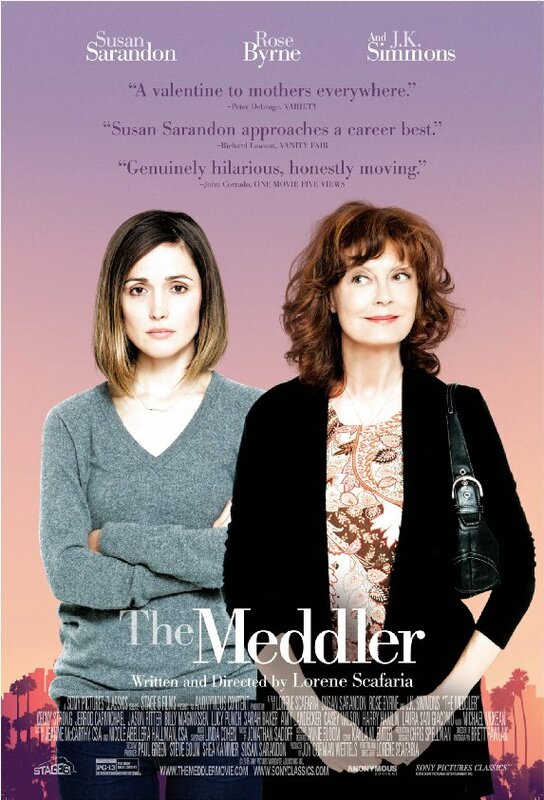 “The Meddler” follows Marnie (wonderfully played by Susan Sarandon), a very kind woman who just became a widow. Luckily, she has a daughter who she can “harasses” with the endless phone calls in a super adorable manner. Lori (Rose Byrne) is a screenwriter and deals with the breakup with her boyfriend, Jacob. Both women seem to try to cope with their internal problems. But at some point, the mother and her daughter will have to face the reason that causes them a heartache. But no matter what is that, one thing is for certain, this story won’t leave disappointed even an indifferent viewer. The touching and sometimes hilarious scenes continue throughout the film as you get know Marnie better. By the time when it happens you will no longer be able to control your emotions as you cry and laugh for joy at the same time. Marnie is genuinely a genial person whose heart is open for everyone: whether it’s a gay couple who wishes to have a dream wedding; a young man at the store that gets help from Marnie to get an education, or a woman who she looks after at the hospital. Every thing about Marnie is pure perfection. Every thing she touches turns into gold which is what makes her one of the most heartwarming characters ever written. However, as the story unfolds, you feel that there is something very sad about Marnie and she tries to hide her loneliness from the rest of the world. This is when Lorene Scafaria as a writer and a director of the film appears as a great master who keeps great balance between the sadness and the real nature of Marnie. Scafaria does not concentrate on Marnie’s issues, which is obvious but rather gives enough freedom to Marnie to get developed in a way you will simply fall in love with her. You as a viewer won’t get confused even for a second trying to figure out why Marnie does so many wondrous deeds, as the answer is very simple: a divine person always does divine things. As simple as that! In conclusion, “The Meddler” is a superbly written well directed film with inspiring performances delivered by Susan Sarandon and Rose Byrne. Both of them are such a great match that you simply can’t stop admiring them seeing together. This film explores a mother-daughter relationship in a way that will leave you in complete tears, and after you watch it you will run to call to your own mother. Regardless you do it or not, you will never leave the theater the same person again. “The Meddler” will transfer you its positive energy that will stay with you long after. Yes, it indeed has a sort of way of communicating with the viewer which only after watching you will understand. So do not wait and see it yourself! Be good and gentle is what this movie is all about.